Here is our group at the lower work area, Hanford Steps. We were visited by Susan Davis (right) from the Rainier Chamber of Commerce, and oriented her to the area and the location of Cheasty Boulevard as it approaches the Town Center. 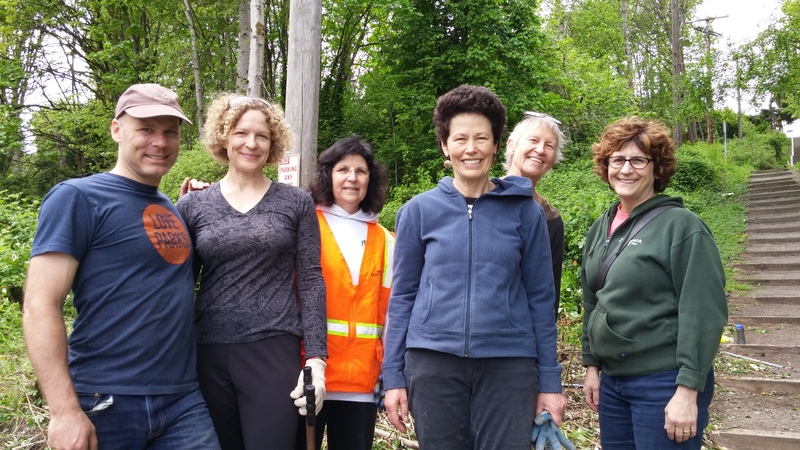 In April, 2015, the Friends of Mt Baker Town Center celebrated the Earth Day weekend with a group of neighbors who focused on restoration of Cheasty Greenspace and the Hanford Steps, where they connect to Mt. Baker Town Center. 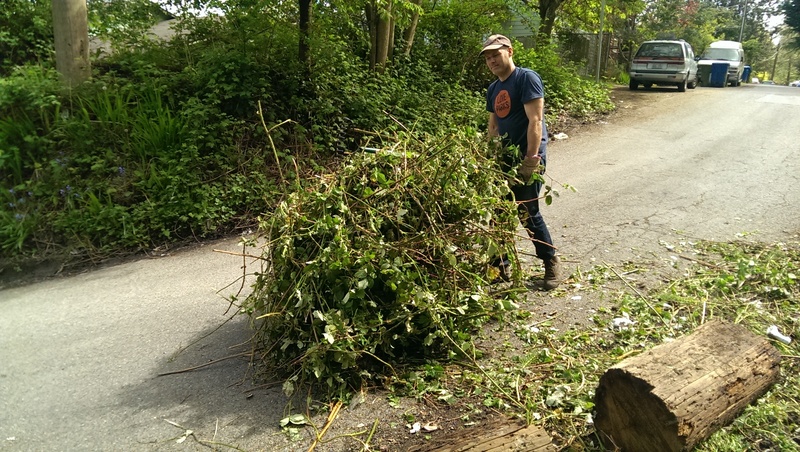 We removed invasive plants, such as the Himalayan Blackberry, disposed of garbage which has accumulated in the greenspace, and improved safety at the base of Hanford Steps. An area off Winthrop Boulevard, now clean! (Before) The base of the Hanford Steps, where blackberries blocked pedestrian visibility to the intersecting roadway. 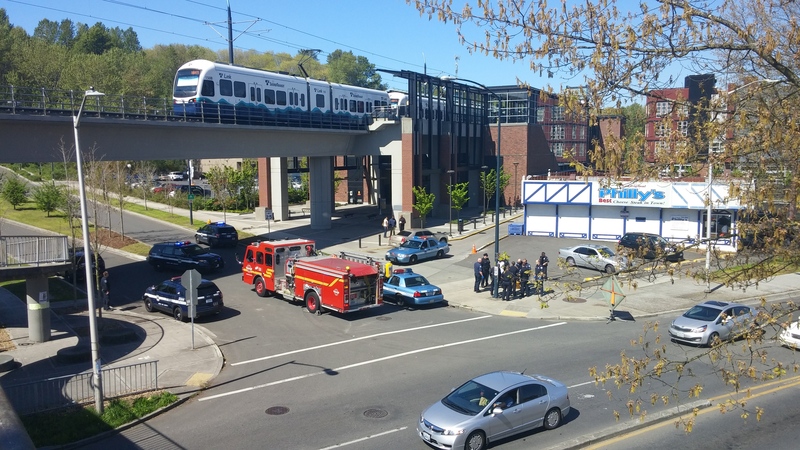 Local residents have asked for better maintenance to improve safer access between Beacon Hill and the Mt Baker Town Center and rail station. 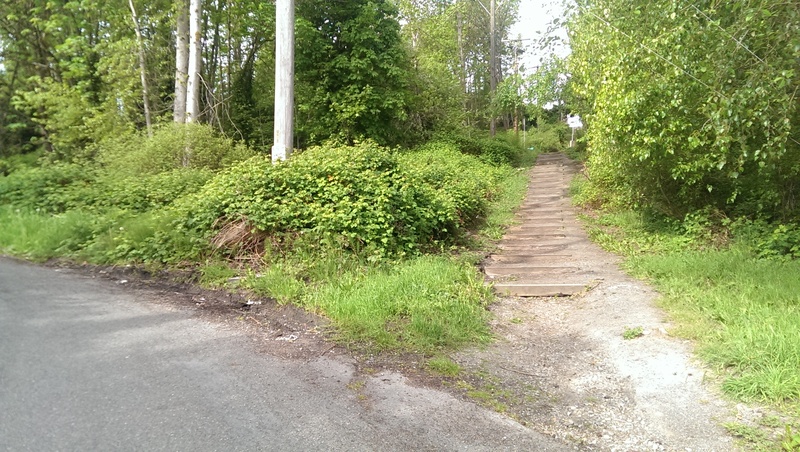 (After) The base of Hanford Steps, cleared of blackberries. The group on Cheasty Boulevard, breaking down. As the blackberries were removed at the base of the steps, we exposed a four foot cement post and a City of Seattle sewer manhole. 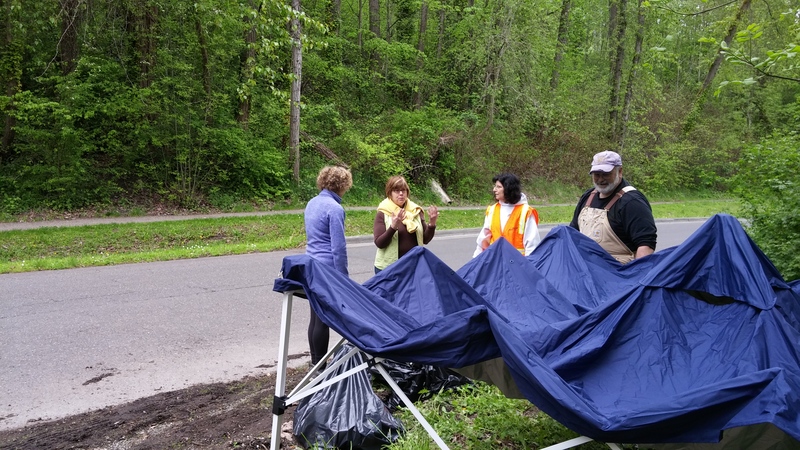 Several residents thanked us for our ongoing efforts, and there is growing interest in stepping up the restoration work in the greenspace adjacent to the light link station. We are also looking forward to partnering with the City on improvements to the steps themselves. The upper Beacon Hill steps include a hand rail and modern cement construction, while the lower portion consists of dirt and wood steps. The lighting is poor as the stairs traverse the greenspace, and stormwater is eroding the bottom path. These stairs do not yet convey the attractive and vibrant entrance that our City’s newest transit oriented Town Center had hoped for (see Urban Design Framework, below). While the area is a historic landmark, the upkeep and infrastructure would benefit from some of the attention received by parks and boulevards in Seattle’s more affluent neighborhoods. The wheelbarrow came in handy! 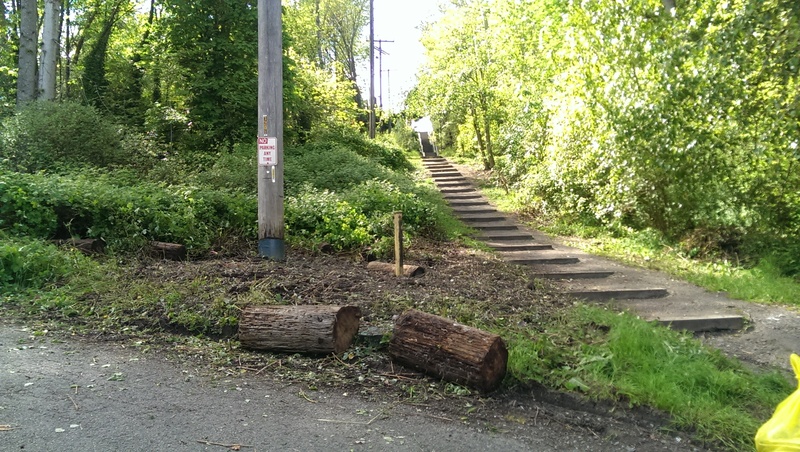 Some residents have been concerned about safety on the Hanford Steps, and we cleared a major section of the base area of the Hanford Steps, to make the Beacon Hill connection safer and more attractive. In February, an employee of our local Wells Fargo Bank (and FMBTC business member) was robbed at gun point on the steps, as young children were walking to school nearby. Another woman was mugged in the last year on the steps. Safety concerns in the poorly maintained area is causing many transit using residents to walk to the Beacon Hill light link instead of the Mt. Baker station, even though it is far closer for them. We felt it is important to make a statement and make the steps more attractive and safer, through clearing the invasive plants and improving visibility at the base for pedestrians. Today we made strides towards that goal, but there is much more work to be done! Stay tuned for announcements as we continue to move towards the North Rainier Neighborhood Plan vision of a vibrant Town Center that is safely connected with its neighboring communities! We typically meet the first Saturday of every month under the Mt. Baker light link station for ongoing cleanup projects. 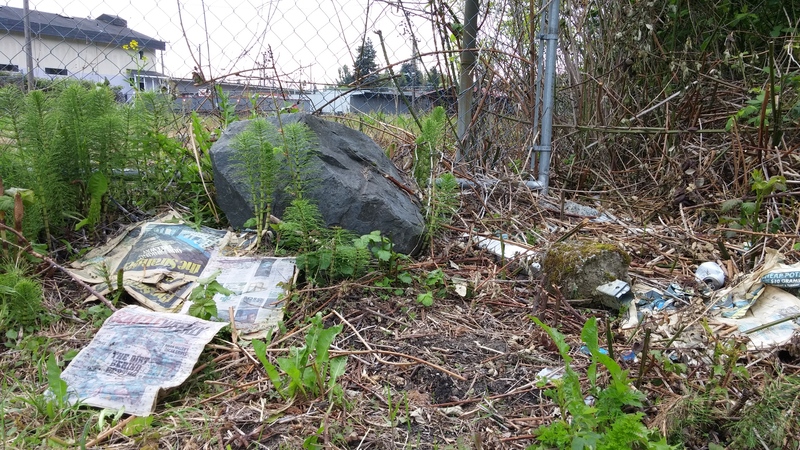 The Cheasty Greenspace is an important but somewhat neglected component of the Seattle Park system. Cheasty is a 43-acre urban forest between Beacon Avenue and Martin Luther King Jr. Boulevard. The Greenspace was originally designed as part of the Olmsted Boulevard Plan for Seattle’s Parks, however trails and other amenities have not been fully developed or maintained as in other parts of the City. On January 15, 2003, Cheasty Boulevard was designated an Historic Landmark by the Landmarks Preservation Board. Cheasty Boulevard connects two major sections of Seattle’s Olmsted boulevard system — Beacon Avenue and Mount Baker Boulevard. The street winds down the eastern side of Beacon Hill, originally connecting Mount Baker Boulevard at the junction of Martin Luther King Jr. Way South and Rainier Avenue South. Mount Baker Boulevard, in tum, connects to Lake Washington Boulevard. Nearing its end, Cheasty Boulevard takes a sharp right tum toward the intersection of Rainier Avenue South and Martin Luther King, Jr. Way. This short east-west section retains its earlier name of South Winthrop Street. Franklin High School is visible ahead, but the original connection to Mount Baker Boulevard is no longer evident. The Olmsted Boulevard is not visible and a mandatory right tum prevents access to the rest of the boulevard system. The reconnection of these important Boulevards is a core mission of Friends of Mt. Baker Town Center. Encourage Setbacks on Pedestrian-Oriented Streets: 1 to 3 years, with the City taking the lead. Encourage redevelopment of opportunity sites: 5 years, with the City taking the lead and collaborating with King County Metro, Private Leaders, and Sound Transit. 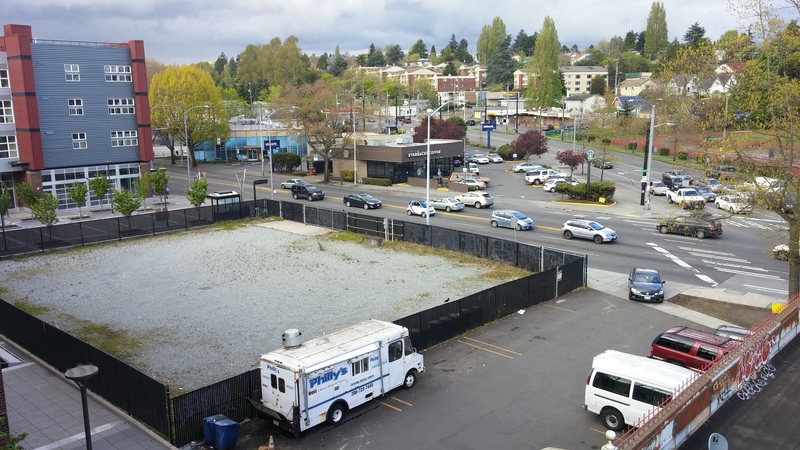 Reconnect Cheasty and Mount Baker Boulevard: 5 years – City partnering with WSDOT. Make pedestrian network complete and safe: 5 years. Seattle, working with private leaders and Sound Transit. Improve ped and bike access to Mt. Baker Station: 3-5. City, private, Sound Transit. Restore the natural and designed landscapes of Cheasty and Mount Baker: 5 plus years – City and Community. Frederick Law Olmsted pioneered the development of urban parks and boulevards throughout the United States, and is credited with developing the profession of landscape architecture. From his travels in England, Olmsted came to feel that “pastoral park scenery with greensward and scattered groves of trees” could serve as an antidote to the stress and artificiality of modern life. Such parks promoted a sense of tranquility by “subordinating individual elements of the park to the overall design.” Parks were to be a place where all citizens could enjoy the pleasures of nature and beautiful scenery. Under the influence of Olmsted, many major American cities built urban parks in the pastoral style, whether designed by the Olmsted firm or others. In Washington, both Tacoma and Spokane hired the Olmsted Brothers to design parks and boulevards (only partially realized). Cheasty Boulevard is an important part of Seattle’s Olmsted boulevard system, a significant aspect of the city’s heritage and cultural development, and one of the most intact such systems in the nation. The boulevard retains its physical integrity and clearly conveys its significance as part of the Olmsted system. Cheasty Boulevard is a significant part of Seattle’s Olmsted Boulevard System, a crucial part of the city’s cultural heritage. 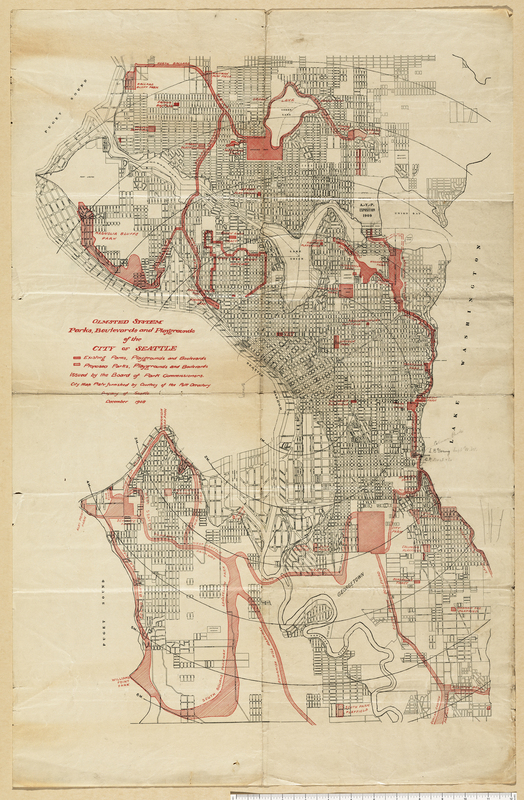 Planning and implementation of this extensive system was a vital part of Seattle’s growth in the early twentieth century, and a symbol of its desire and ability to be a major city and to meet the needs of its citizens in an urbane manner. 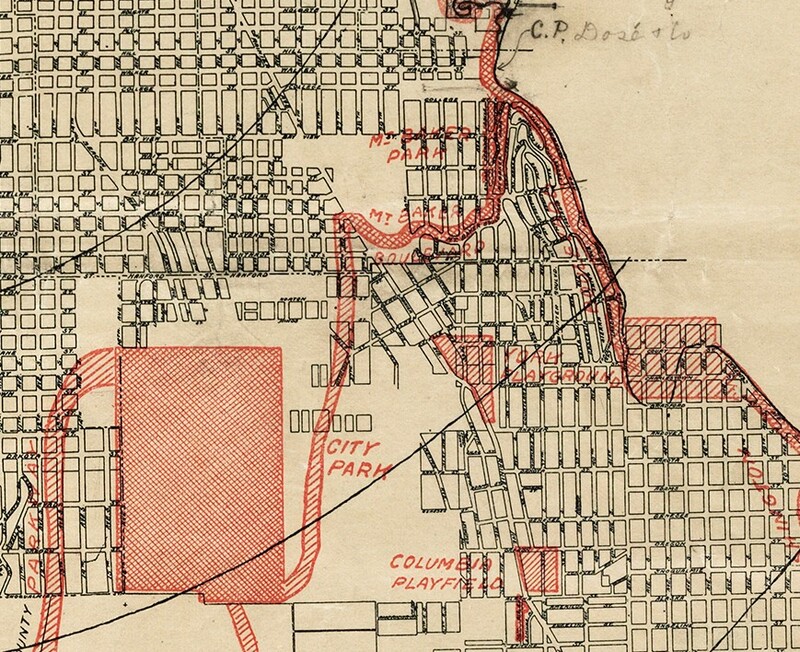 Cheasty Boulevard was designed to connect a major park and boulevard, Jefferson Park and Beacon Avenue South, with Mount Baker Boulevard and the Lake Washington Boulevard system. Cheasty Boulevard is a component of the boulevard system planned by the Olmsted Brothers in 1903. One of the defining characteristics of an Olmsted boulevard system is that it connects the various parks and boulevards with one another and Cheasty is a connection between two major segments of the system. The work of the Olmsted Brothers work had a significant influence on the development of landscape architecture, city planning and urban design throughout the country, as well as in Seattle. Seattle’s Olmsted park and boulevard system is widely acknowledged as one of the best and most intact such systems in the United States. 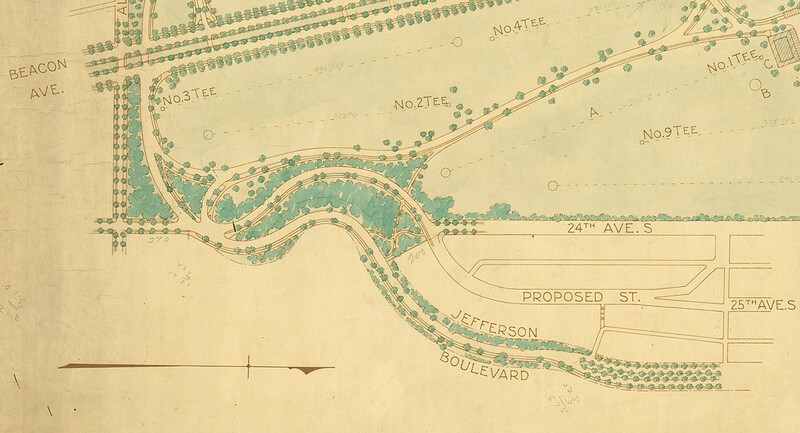 As a part of the Olmsted park and boulevard system, Cheasty Boulevard contributes to Seattle’s distinctive identity. These parks and boulevards are a significant part of the city’s character and of its park and open space resources. The street is also an easily identifiable feature of Beacon Hill and contributes to the unique identity of the neighborhood. Help North Rainier Valley’s Mt. Baker Town Center become a true Town Center, where its diverse residents and businesses can benefit and thrive with an infrastructure equal to other parts of our great City, fulfilling its role as a vibrant area connected to its neighboring communities.